Home > Apologetics Topics > Philosophical Questions > What Is Belief? Is it Really a Choice? Is Belief Really a Choice? Thank you so much for writing and asking an important question. I think it warrants some careful study since our beliefs are the basis of our worldview. Philosophers have argued over this problem for centuries. I think to do the question justice we look at it in several levels - philosophically, theologically, and practically. Whenever we talk about beliefs and choices, it inevitably leads to a discussion of free will. Are human beings able to make any free choices at all? I have argued previously that we are, so I won't revisit that discussion. But libertarian freedom implies that you can choose to investigate and reason through ideas. God holds us accountable for our actions and our choices. One aspect of being human is the ability to look beyond one's habits and customs and ask questions like "why". Why do we do this or that? What reasons do we have for doing thus and so? In fact, we consider it progress when we don't simply act as we have done in the past, but investigate whether what we are doing has good reasons behind it. As an example, for many years, people held to the belief that those of African descent were somehow less human than other people on the planet and could be bought and sold as property. It was only after a dedicated minority of people such as William Wilberforce began to insist through discourse and argument that beliefs began to change. Even today, I know of many people who had some type of belief or conviction that they were taught but now no longer hold since they thought through the arguments. So, I would see this as proof that a specifically held belief can be changed by the exchange of ideas and some hard thinking on the topic. The Bible teaches this view as well. We know that we are told to test our beliefs - even those that support Christianity. Paul writes in 1 Thessalonians 5:21 that we should "examine everything carefully; hold fast to that which is good". This means all that we hold should be looked at with careful consideration to see if there is a good basis for our holding that view. The clearest view of this were those in Berea mentioned in Acts 17:11, who didn't just accept Paul's teaching, but checked it against the scriptures - making sure that Paul's claims lined up with their theology. The Bible also teaches us that we have choices as to what we should believe. Consistently, we are admonished throughout the Scripture to choose whom we will serve. The most well known verse to this effect is John 3:16 "For God so loved the world, that He gave His only begotten Son, that whoever believes in Him shall not perish, but have eternal life." According to Kittel's Theological Dictionary of the New Testament, the verb for believe means to entrust and also carries an idea of committing oneself to the person or idea.1 It can mean to be persuaded of a certain position. In the book of Romans, Paul says that if one believes in their heart that Jesus is raised from the dead, they will be saved. Are Beliefs Limited to Our Culture? Now, I understand that the crux of your question seems to lie in the concept that people can only know those things that they are exposed to. The medieval physicians for example, held to many wrong beliefs about the human body since they didn't have the benefit of modern medical learning. Even the Bible seems to argue this way. In Romans 10, Paul asks "How will they believe in Him whom they have not heard?" That's a good question. 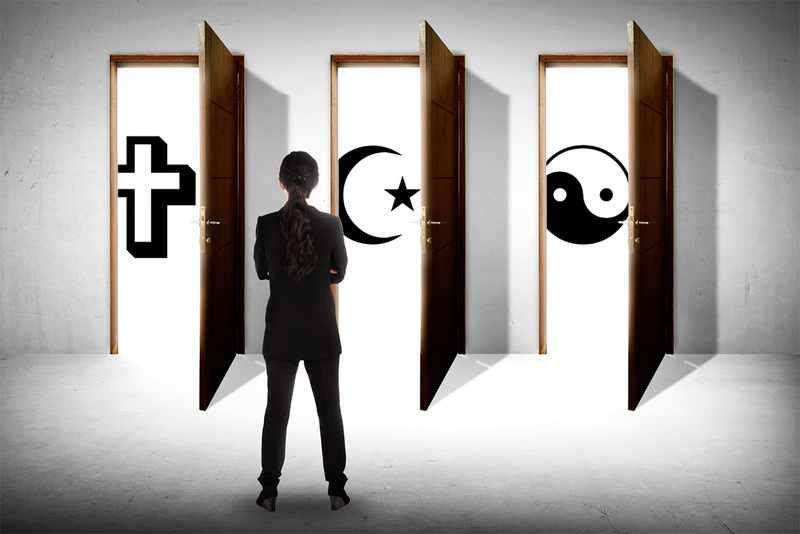 Are people "destined' to believe in one faith since they haven't been exposed to any other? No, they aren't, because belief in one proposition isn't predicated on exposure to another proposition, but only on the merits of the proposition being presented. Let me use a courtroom analogy to illustrate. Suppose you are on a jury of a court case where Mr. Smith is the defendant and he has been accused of murder. The prosecuting attorney begins his opening remarks by telling you how the people will show that Mr. Smith hatched an elaborate scheme to kill Mr. Jones. He knew Mr. Jones cleans his rifles every Saturday afternoon and he would shoot Mr. Jones with his own gun, making the crime look like an accident. Mr. Smith also planned on the perfect alibi, by having a double appear with his wife at their child's baseball game that same afternoon. The prosecution then brings out witnesses for his case who confirm that Mr. Jones does clean his guns on Saturday and that a man who looked like Mr. Smith was seen at a baseball game that same afternoon, but the witness said Mr. Smith looked a bit different than normal. The prosecution finally produces a witness that says Mr. Jones owed Mr. Smith some money and Mr. Smith had been upset that Mr. Jones hadn't yet repaid him. Other than Mr. Smith, no one had anything against Mr. Jones and there was no signs of theft in the house. Given all the information above, would you convict Mr. Smith of murder? I don't believe a prudent person would do so. Some people might conclude that the prosecution is right in their scenario, but the evidence for holding to the belief that Smith murdered Jones is just not strong enough. You don't have any alternative theory as to why Jones was murdered, but that doesn't mean you must believe the version that is offered. You may feel that more investigation is warranted, however you are not obligated nor should you as a thinking person hold to a view that has less than sufficient reason to believe it is true. This same concept holds true in all our beliefs about God and the world. Beliefs make truth claims that can be examined to see if they are internally consistent and externally consistent. An internally inconsistent belief is one where its own claims contradict each other. Logical positivism is a good example of this. Logical Positivists held a principle called the verification principle which said that for a non analytical statement to be meaningful, it must be empirically verifiable.2 Of course, the statement "for a non-analytical statement to be meaningful, it must be empirically verifiable" is neither analytic nor able to be proven empirically3, so it becomes internally inconsistent. A belief is externally inconsistent if any of its claims contradict what we know to be true. Baha'i beliefs hold that "God has revealed Himself to humanity through a series of divine Messengers, each of Whom has founded a great religion. "4 However, if the fundamental tenants of each of these "great religions" contradicts each other, then their claim that cannot be true. Jesus held to the concept of a single God, while other faiths like Hinduism hold to multiple gods and yet others like Buddhism don't believe in a personal God at all. All these views of God are in competition with each other - it is impossible for all of them to be true. Further, Jesus taught that God had a son, whom He called "His only begotten son", while Muhammad taught that God does not beget nor is He begotten". Again, these teachings stand in direct opposition to each other, therefore, Baha'ism is externally inconsistent. It makes claims that don't match the reality of the world. The concept of consistency is a good way to begin to judge the truthfulness of any belief system, including the one in which a person is raised. If a belief is internally inconsistent, you don't need to be exposed to any other beliefs to recognize the problems with the inconsistent belief. As an example, look at the way our understanding of medicine and the human body have changed. We no longer believe in blood-letting and such things - and even if we don't know what the diagnosis is, we wouldn't resort to treating a patient using those concepts. Christianity is unique in its challenge to its adherents to test its claims and see if they are true. Paul says that the entire faith if the Christian rests on the historical fact of the resurrection. If that's not true, then we are liars and we should be rejected. To this end, God has given us our reasoning faculties so that we don't simply follow whatever we're taught. To do so doesn't show maturity and wisdom as a person. 1. Kittel's Theological Dictionary of the New Testament Bromiley, Geoffrey W. Ed. 2. Miller, Ed. L. Questions that Matter: An Invitation to Philosophy. 3. The idea of something being empirically verifiable means that it can be proven true either mathematically or scientifically. An analytic statement is a tautology such as "all unmarried men are bachelors." "As a Pastor who is concerned that the congregation I serve is well-equipped, I was delighted with our Come Reason Apologetics Conference. Lenny Esposito led a conference that was intellectually challenging, yet accessible"